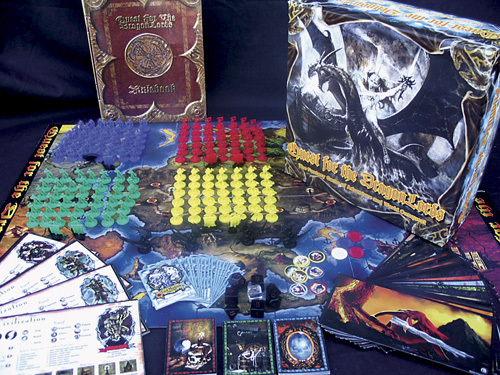 Quest for the DragonLords is a beautifully illustrated fantasy boardgame of adventure and world conquest. You control the fate of your civilization as you manage your resources to build vast armies and longships to conquer your opponents. 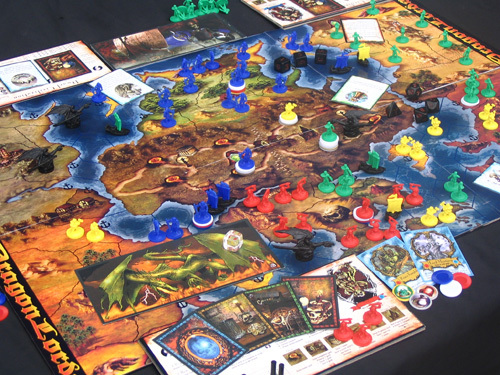 The game comes complete with close to 200 finely detailed miniature Elves, Barbarians, Dwarves, Orcs, Longships and DragonLords. Each of the four civilizations has special abilities and unique spells available to their Wizards that give a whole new strategy with each time you play. The game creates a very rich atmosphere of Norse mythology as you explore quests in such malevolent places as the ancient ruins, forbidden forests and torture chambers. With over 100 uniquely illustrated game cards allows all new prophecies, characters, treasures, scrolls and quest cards, to immerse you into a truly lush game of adventure and intrigue. You, as King or Queen of your civilization, must choose between expanding your empire to increase your revenue or face the difficult task of protecting your realm from marauding ships and teleporting Wizards that may attack you at any time. Vigrond is the battlefield where the DragonLords clashed in the first age during the Dragon Wars. You must dispatch a quest party that may visit the Witch's Den to gain potions and other tools to help you on your quest. Legendary heroes gather in the villages that may help you or betray you at the worst possible moments. Your quest party may visit Shrines containing scrolls that are very powerful spells or visit the Oracle where the gods may reveal hidden truths and secrets lost to all but a few. The Dragon Lair is said to contain a path to the serpent Nidhogg the devourer, who may bless you with the omnipotent power of a DragonLord. DragonLords use dragonfire and have the ability to teleport to any territory in the world along with the army that it commands. May the gods bless your Quest for the DragonLords to lead your legions and fleets to victory!